We undertook this audit to assess the extent to which city officials had taken timely, appropriate corrective action in response to audit findings and recommendations. The city charter requires our office to report on completed audits, major findings, management's corrective actions, and significant findings. Management agreed with 87 percent of the 545 audit recommendations we have made since 2002. 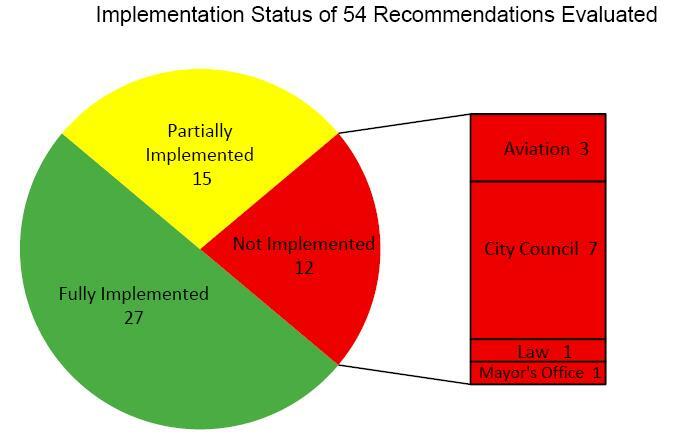 The city had at least partially implemented 78 percent of the 54 recommendations we assessed in this report; 27 recommendations were fully implemented and another 15 were partially implemented. Three of the 12 recommendations that had not yet been implemented addressed compliance with federal regulations. The remaining recommendations not yet implemented were intended to improve planning and budgeting, monitoring and reporting, and cost recovery.